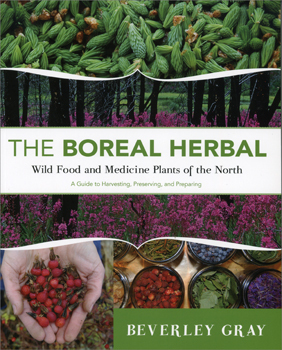 The Boreal Herbal: Wild Food and Medicine Plants of the North is an indispensable guide to identifying and using northern North American (and in many cases European and Asian) plants for food and medicine. Whether you're hiking in remote areas or gardening in your backyard, this easy-to-use handbook will help you recognize and use fifty-five common wild plants that have extraordinary healing properties. With The Boreal Herbal by your side you will learn how to soothe aches and pains with willow, staunch a bleeding wound with yarrow, treat a urinary-tract infection using bearberry, and create a delicate and moisturizing wild-rose skin cream. Author Beverley Gray has also included dozens of healthy and delicious recipes, including Wild-Weed Spanakopita, Dandelion Wine, and Cranberry-Mint Muffins.